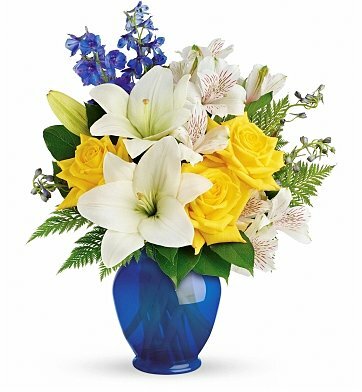 This invigorating mix of yellow roses, white lilies and blue delphinium captures the spirit and shades of the shoreline. Hand-delivered in a bold blue ginger jar, it's a delightful gift any time of year! Blue Delphinium, Lush Greenery and more. Standard Arrangement Measures 14" x 17". Oceanside Garden is a hand delivered gift. These gifts are delivered by one of our local design centers located throughout the United States and Canada. Same day delivery is available for most gifts when ordered before the cutoff time. The cutoff time for Oceanside Garden is 10 AM in the recipient's time zone. Most beautiful arragement, love matching vase and floral selection. Beautiful arrangement- the flowers were fresh and plentiful. My mom loved them. This is the second time I have used this florist and each time I have been very pleased! The delivered flowers were very nice and looked like the online picture. They were deeply appreciated. On March 25 the Oceanside Garden bouquet was delivered to the hospital in celebration of my new grandson. My son sent me pics & my daughter-in-law said she absolutely loved the flowers! I was so happy the flowers were just as fresh & beautiful as shown. A nurse commented the flowers were lovely & the vase was a keeper! Thank you. They were very fresh flowers and delivered right on time. The recipient loved them!